Start Time Team choice. Between Thur noon and Sat 7PM. Entry Fee: None, Oregon Randonneurs membership required. 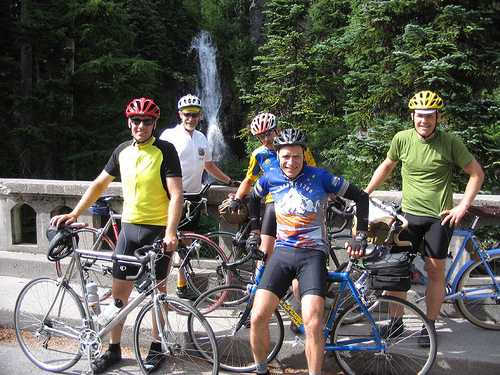 This will be a joint destination event with Seattle International Randonneurs. Both clubs have 12 & 24-hr events finishing in Centralia, WA. The RUSA website has detailed information regarding Dart & Arrow events. Please read this information before submitting your questions to the organizer. If you plan to spend the night at the Olympic Club Hotel, make reservations as soon. A block of 10 rooms (Bunk & Queen) is reserved under "Oregon & Seattle Randonneurs", call to place a room under your credit card. Rooms released March 22. We have a breakfast reservation at the Olympic Club Hotel for Sunday at 9AM. This is no-host. Plan to share your tales with other teams. Other Centralia sleeps. Check Amtrak's Cascade , it is an excellent option for returning to your start location (Portland or Seattle) on Sunday afternoon. Be sure to read about taking your bicycle aboard near the bottom of the page. Once you receive your control cards, check them for accuracy. Contact the organizer immediately of any changes in team members, etc. Go over the rules of team events with your team. In particular, team members should note the location and distance of their 10 or 22 Hr Control. Team members must complete a minimum of 25km in the last 2 hrs of their event. And most importantly, team members must finish together in the 12th and 24th hour. Do not leave your teammates in those final 2 hours. All riders should be familiar with and abide by rider expectations.